1. Governing Committee: Taichung Municipal Government and Taichung Sports Association. 2. Sponsor: L.C.Y. Fencing Club. 3. 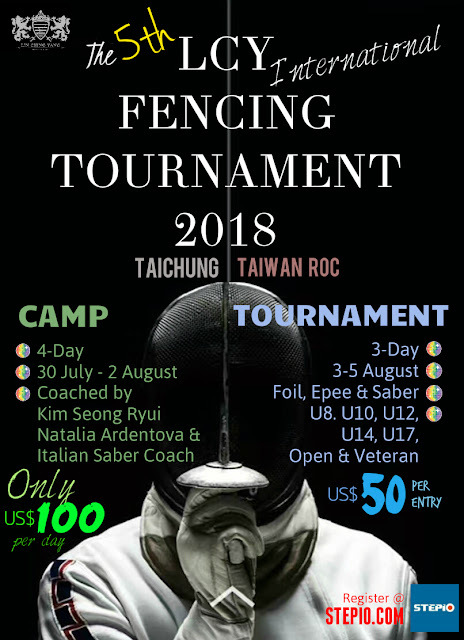 Co-organizer: The Fencing Association of Taiwan ROC, The National Taiwan Sports University and the Feng Chia University. 4. Tournament Date: August 03 to 05, 2018. 5. Pre-Tournament Training Camp: July 30, 2018 to August 02, 2018, 4 days. the Taiwan Sports University's professional team will come to train and skill exchange with campers. (1) the 8-year-old should be born after 1 January, 2010. (2) the 10-year-olds should be born after 1 January 2008. (3) the 12-year-olds should be born after 1 January 2006. (4) the 14-year-olds should be born after 1 January 2004. (5) the 17-year-olds should be born after 1 January 2001. (6) Open Group: Regardless of age. (1) 8-year-old men's: foil individual, epee individual, saber individual. 8-year-old women's: foil individual, epee individual, saber individual. (2) 10-year-old men's: foil individual, epee individual, saber individual. 10-year-old women's: foil individual, epee individual, saber individual. (3) 12-year-old men's: foil individual, epee individual, saber individual. 12-year-old women's: foil individual, epee individual, saber individual. (4) 14-year-old men's: foil individual, epee individual, saber individual. 14-year-old women's: foil individual, epee individual, saber individual. (5) 17-year-old men's: foil individual, epee individual, saber individual. 17-year-old women's : foil individual, epee individual, saber individual. (6) Open men's: foil individual, epee individual, saber individual. Open women's: foil individual, epee individual, saber individual. (7) Veteran men's: foil individual, epee individual, saber individual. Veteran women's: foil individual, epee individual, saber individual. (8) 10-year-old men's: foil team, epee team, saber team. 10-year-old women's: foil team, epee team, saber team. (9) 14-year-old men's: foil team, epee team, saber team. 14-year-old women's: foil team, epee team, saber team. (10) 17-year-old men's: foil team, epee team, saber team. 17-year-old women's: foil team, epee team, saber team. (11) Open men's: foil team, epee team, saber team. Open women's: foil team, epee team, saber team. (1) 8 and 10-year-old and Veteran individual: group cycle and single elimination. Group cycle 5 hits in 2 minutes. In the semi-final and final, it is 10 hits in 3 rounds. Foil and Epee is 2 minutes per round with 1 minute break; whereas Saber is 1 minute break once one side gets 5 hits. (2) 12-years-old, 14-years-old, 17-years-old and Open: group cycle and single elimination. Group cycle 5 hits in 3 minutes. In the semi-final and final, it is 15 hits in 3 rounds; 3 minutes per round with 1 minute break. (3) if there are fewer than 4 fencers in Veteran, the competition will be held combined and handicap system will be adopted. Individual competition: each person can participate in more than one group per day in one weapon only, no mixed weapons is allowed. Team competition: free to join team, not subject to individual group registration and team name restriction, can register with different weapons. Training camp fee: US$100 per person per day, US$400 for 4 days. 11. Registration Deadline: July 13, 2018 (per email collection date or post stamp date). Please fill in the registration form and email to the person-in-charge: Mr. Lin Jing Yang. Please specify the subject as 'International Invitational Tournament - Name of Organization', and the receipt email will be sent to you. If you do not receive a reply by email within 3 working days, please confirm your registration by email again. 12. Daily Schedule: 8:30 a.m. check-in, 9:00 start on-time. Equipment Inspection : 14:00-18:00, August 02; and 8:00 on everyday, priorized according to the schedule. Equipment check prior to competition is required. (1) 8-year-old men's epee group, 8-year-old men's saber individual, and 8-year-old women's foil individual. (2) 10-year-old men's foil individual, 10-year-old women's epee individual, 10-year-old women's saber individual. (3) 12-year-old men's epee individual, 12-year-old men's saber individual, 12-year-old women's foil individual. (4) 14-year-old men's foil individual, 14-year-old women's epee individual, 14-year-old women's saber individual. (5) 17-year-old men's epee individual, 17-year-old men's saber individual, 17-year-old women's foil individual. (6) Open men's foil individual, Open women's epee individual, Open women's saber individual. (1) 8-year-old men's foil individual, 8-year-old women's epee individual, 8-year-old women's saber individual. (2) 10-year-old men's epee individual, 10-year-old men's saber individual and 10-year-old women's foil individual. (3) 12-year-old men's foil individual, 12-year-old women's epee individual, 12-years-old women's saber individual. (4) 14-year-old men's epee individual, 14-year-old men's saber individual, 14-year-old women's foil individual. (5) 17-year-old men's foil individual, 17-year-old women's epee individual, 17-year-old women's saber individual. (6) Open men's epee individual, Open men's saber individual, Open women's foil individual. (7) Veteran men's epee individual and Veteran men's saber individual. (8) Veteran women's epee individual and Veteran women's saber individual. (1) 10-year-old men's foil team, 10-year-old men's epee team, 10-year-old men's saber team. (2) 10-year-old group women's foil team, 10-year-old women's epee team, and 10-year-old women's saber team. (3) 14-year-old men's foil team, 14-year-old men's epee team, and 14-year-old men's saber team. (4) 14-year-old women's foil team, 14-year-old women's epee team, 14-year-old women's saber team. (5) 17-year-old men's foil team, 17-year-old men's epee team, 17-year-old men's saber team. (6) 17-year old women's foil team, 17-year-old women's epee team, 17-year-old women's saber team. (7) Open men's foil team, Open men's epee team, Open men's saber team. (8) Open women's foil team, Open women's epee team, Open women's saber team. (9) Veteran men's foil individual, Veteran women's foil individual. This competition will produce the coach certificates for all coaches, according to the names of each organizations in the registration form. (1) rules will refer to the international fencing federation (FIE) competition rules. (2) in order to implement the identity verification, participants must show identification or passport for reference. (3) during the competition, the participants will be covered by 3rd party insurance and medical injury insurance. (4) equipment rental is not provided, the fencers shall prepare their own qualified weapons. Please be sure to wear fencing uniforms with 350N or above, or will be dealt with according to the rules. (5) the competiton arena is strictly for personnel to enter, except the referees, fencers and a team's coach (wearing their coach certificates) and the staff. Parents and other personnels should be at the spectators' stand and rest area outside the arena. (i) based on group cycle and the final elimination format. (ii) the champion, 1st round-up and 2nd round-up will be awarded with medals and certificate; the 2nd and 3rd round-up will also be recognized, and the fifth to eighth ranks will issue certificates. (7) 8 and 10-year-old competition should use No. 0 foil and epee weapons with 77.5 cm in length, and Number 0 saber weapon is No. 0 with 76.5 cm in length. 12-year-old and above is required to use No. 5 foil weapon, No. 5 foil and epee weapons are with 90cm in length, and No. 5 saber weapon is 88cm in length. (8) if the above is not complete, it shall be resolved and per the general meeting's decision in due course.